Ahead of a hearing on the morning of Oct. 6 in Des Moines regarding the Gerhild Krapf v Bruce Rastetter et al court case, The Daily Iowan created a timeline of the 2015 presidential search. Former state Board of Regents President Bruce Rastetter announces the appointment of Bruce Harreld as the new UI president during a meeting in the IMU on Sept. 3, 2015. Harreld is the 21st president of the UI. 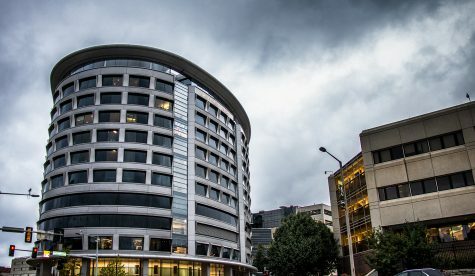 Five current and former members of the state Board of Regents will testify in a hearing on the morning of Oct. 6 in Des Moines regarding the regents’ efforts to circumvent Iowa Open Meetings Law to meet secretly with now-University of Iowa President Bruce Harreld on numerous occasions in 2015 prior to his hiring. 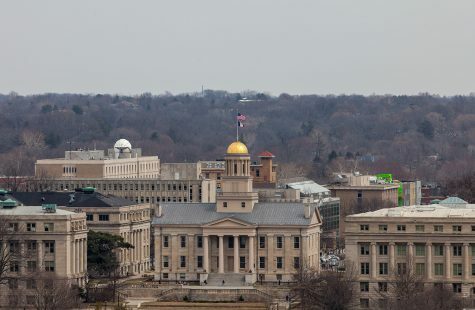 The regents compose a nine-member governing body that oversees decisions affecting the UI, Iowa State University, and the University of Northern Iowa, including presidential searches. They are appointed by the governor and confirmed by the Iowa Senate. In the months leading up to his first moment on the clock, Harreld had been scrutinized for his qualifications and performance. 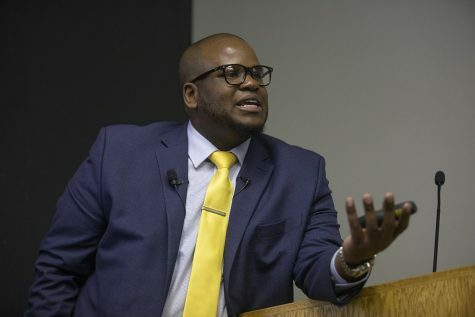 The criticism largely stems from his background in the business world; other candidates for the UI presidency were employed in higher-education administration positions. Gerhild Krapf v Bruce Rastetter et al is a court case stemming from some of that criticism. 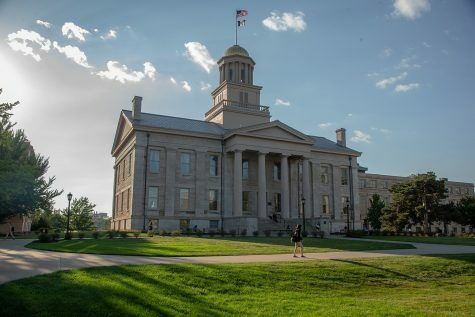 The plaintiff, former UI administrator Gerhild Krapf, filed the civil suit in May 2015 alleging the regents — mainly former Regent President Bruce Rastetter — actively recruited Harreld and violated Iowa Open Meetings Law in the process. A nonjury trial is scheduled for Nov. 6. Jan. 15, 2015: Then-UI President Sally Mason announces her intent to retire in August 2015. Feb. 2, 2015: The regents select UI Vice President for Medical Affairs Jean Robillard as chair of the Presidential Search Committee. Feb. 25, 2015: The regents name the 21 members of the search committee, who will conduct the search in conjunction with Parker Executive Search, a search firm. March 25, 2015: The search committee meets for the first time. Rastetter announces he nominates Robillard interim UI president. March 2015: Rastetter calls Harreld to encourage him to consider applying for the UI presidency, per a recommendation from Jerre Stead, a UI alumnus and major donor. Rastetter communicates with Robillard about Harreld later at an unspecified date. April 22-23, 2015: Robillard is officially voted interim UI president at a regent meeting. May 8, 2015: The search committee meets for a second time to approve the job description and start officially advertising the position. Members determine that individuals will be discouraged from applying if the name and accompanying information are made public, as it could become problematic for their current place of employment. July 1, 2015: The search committee meets for a third time. 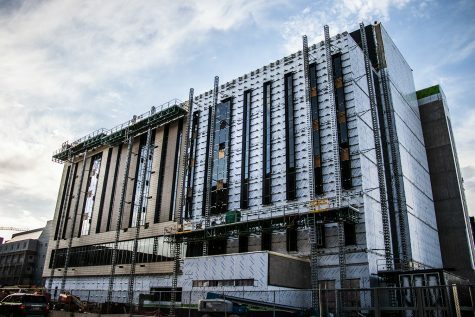 Parker compiled a list of more than 500 individuals to contact regarding the position, including leaders at other higher-education institutions and nontraditional candidates. Two nontraditional candidates are considering applying. Parker is still in active recruitment. July 8, 2015: Upon Robillard’s invitation, Harreld visits UIHC to give a presentation on leadership. 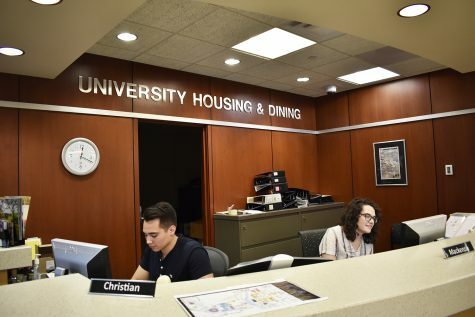 He eats lunch with four search-committee members: Rastetter, Robillard, Bohannan, and Tippie College of Business Dean Sarah Gardial. 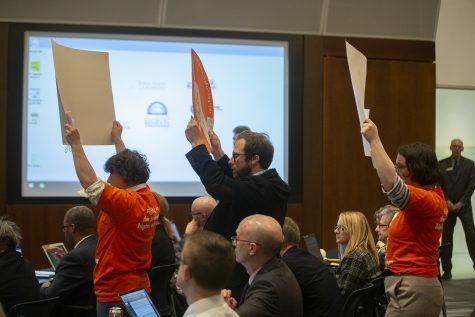 Sometime after that, Rastetter and Harreld agree over the phone to meet with other regents because Harreld is seeking more information about the position. July 30, 2015: Rastetter picks Harreld up from the airport in Ames. 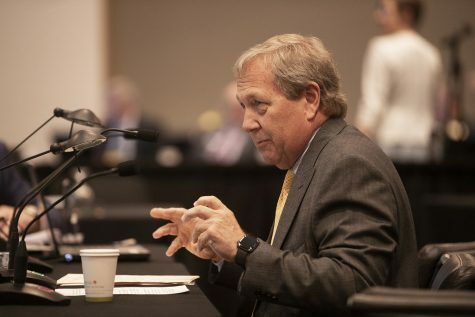 The search committee holds a telephonic meeting at 1 p.m. Later on, Harreld meets with the regents no more than two at a time. First, Harreld meets with Larry McKibben and Mary Andringa, who are not members of the search committee, at 2 p.m. Regents Katie Mulholland and Milt Dakovich, who both serve on the search committee, meet with Harreld at 4 p.m. The meetings take place at the Ames office of the Rastetter-led Summit Agricultural Group. Additionally, Harreld meets with then-ISU President Steven Leath for dinner, arranged by Rastetter. July 31, 2015: The day of the application deadline, Harreld and Andringa share an email exchange. 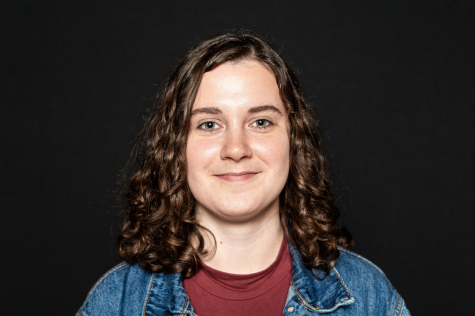 Andringa urges Harreld to consider the UI presidency. Aug. 4, 2015: The search committee selects nine candidates, including Harreld, for off-campus interviews in Chicago in its fifth meeting. Aug. 11-12, 2015: The 21-member search committee interviews Harreld and eight other candidates in Chicago. The group is narrowed to four semifinalists: Ohio State University Provost Joseph Steinmetz, Tulane University Provost Michael Bernstein, and Oberlin College President Marvin Krislov. (The three other candidates have since taken positions at other universities.) The search committee is disbanded after the selection of semifinalists. Sept. 1, 2015: Harreld visits campus for the final candidate open forum. Sept. 3, 2015: After meeting in closed session with each candidate for one hour, the regents appoint Harreld 21st president of the UI. Sept. 8, 2015: The UI Faculty Senate votes “no confidence” in the regents. 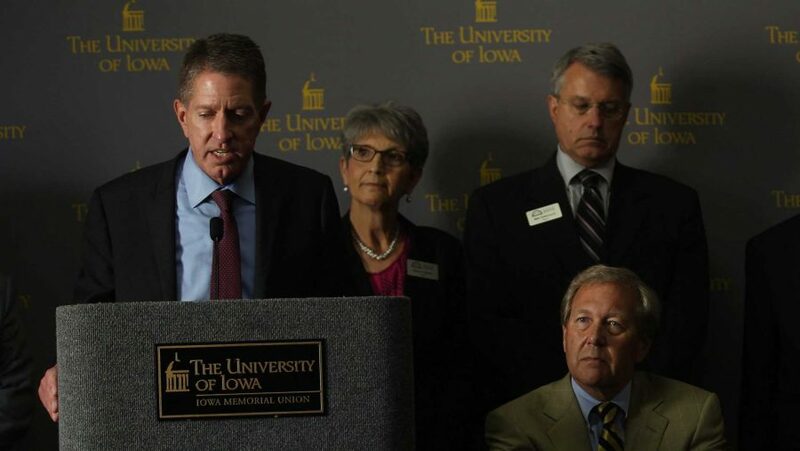 Nov. 2, 2015: Harreld begins his tenure as UI president.